For other uses, see Let the Fire Burn (disambiguation). 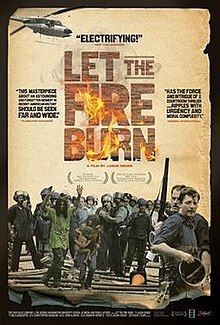 Let the Fire Burn is a 2013 documentary film about the events leading up to and surrounding a 1985 stand-off between the black liberation group MOVE and the Philadelphia Police Department. The film is directed and produced by Jason Osder and was released by Zeitgeist Films in October 2013. The MOVE organization was originally established as a "back to nature" movement that practiced "green" methods. In 1985 The police department decided to take action to evict the group from their row house at 6221 Osage Avenue. When gun fire broke out and tear gas was not enough to pull the MOVE members out of the house, the police decided to drop explosives on the house. A fire soon began to blaze, endangering the several children now trapped inside the house. In a controversial decision, the police opted to "let the fire burn", resulting in the destruction of over 60 homes and the death of five children and six adults. Officials said they feared that MOVE would shoot at the firefighters. Eleven people (John Africa, five other adults, and five children aged 7 to 13) died in the resulting fire, and more than 250 people in the neighborhood were left homeless. Ramona Africa, one of the two survivors, said that police fired at those trying to escape. The investigation commission that followed found that city leaders and law enforcement had acted negligently, but no criminal charges were filed. 2013: Tribeca Film Festival, Official Selection. Award for Best Editing in a Documentary, Best New Documentary Filmmaker – special jury mention. Following its world premiere at the 2013 Tribeca Film Festival, the film received uniformly positive reviews and has been a critical success throughout its theatrical run. At review aggregater Rotten Tomatoes, the film received overwhelmingly positive reviews with a 97% "certified fresh rating" and a consensus stating that the film is "Smartly edited and heartbreakingly compelling". ^ Obenson, Tambay. "Exclusive: Zeitgeist Films Takes US Rights To Powerful, Lauded Doc 'Let The Fire Burn'". IndiWire. Retrieved 17 July 2013. ^ 25 Years Ago: Philadelphia Police Bombs MOVE Headquarters Killing 11, Destroying 65 Homes democracynow.org. Retrieved 14 May 2015. ^ Stevens, William K. (14 May 1985). "Police Drop Bomb on Radicals' Home in Philadelphia". New York Times. Archived from the original on 12 June 2012. Retrieved 31 August 2012. ^ Frank Trippett (May 27, 1985). "It Looks Just Like a War Zone". TIME magazine. Retrieved 2009-02-15. The Move property on Osage Avenue had become notorious for its abundant litter of garbage and human waste and for its scurrying rats and dozens of dogs. Bullhorns blared forth obscene tirades and harangues at all times of day and night. MOVE members customarily kept their children out of both clothes and school. They physically assaulted some neighbors and threatened others. ^ Brian Jenkins (April 2, 1996). "MOVE siege returns to haunt city". CNN.com. Retrieved 2008-08-01. ^ Terry, Don (1996-06-25). "Philadelphia Held Liable For Firebomb Fatal to 11". The New York Times. Retrieved May 13, 2010. ^ "Let the Fire Burn". Tribeca Film Festival. Archived from the original on 28 July 2013. Retrieved 17 July 2013. ^ Rotten Tomatoes, "Let The Fire Burn". Accessed April 9, 2014. ^ Rapold, Nicolas (1 October 2013). "Dropping In on Tragedy, as if You Were There". The New York Times. ^ DeFore, John (26 April 2013). "Let the Fire Burn: Tribeca Review". The Hollywood Reporter. Retrieved 17 July 2013. ^ Rea, Steven. "MOVE doc gets theatrical distribution, will open in fall". Philly.com. Retrieved 17 July 2013. ^ Hornaday, Ann (5 December 2013). "'Let the Fire Burn' movie review: Documentary revisits the MOVE bombing of 1985". The Washington Post. ^ Macdonald, Moira. "'Let the Fire Burn': Emotions smolder long after conflict". ^ Grierson, Tim. "Let the Fire Burn".